Imagine exploring the Fish River Canyon – from as close as can be and without lugging a heavy backpack along! The Trekking Tours offered by Mule Trails Namibia enable hiking enthusiasts to enjoy the stark beauty of almost pristine nature in the second largest canyon on earth. Luggage and equipment are carried by mules while hikers only have to take a light rucksack for the day’s necessities. A seasoned tour guide points out and explains the rock formations which are millions of years old, as well as the unique flora and fauna. This trail takes participants into the wilderness area north of the main lookout point. Nights are spent in a tent or in the open, depending on personal preference and outside temperatures. The Fish River Canyon, the second largest canyon on earth, is situated in the transition zone between two desert systems, the Nama Karoo and the Succulent Karoo (the world’s most diverse desert). The landscape is characterised by meandering gorges which are up to 500 m deep and twist and turn through layers of rock which are millions of years old. The flora includes unique plants like the quiver tree, candelabra euphorbia or tamarisk; game such as mountain zebra, klipspringer, kudu, duiker, springbok and ostrich abounds in the area. Imagine exploring the Fish River Canyon from as close as can be, hiking with just a daypack in almost pristine nature, dreaming at the campfire and falling asleep under a dazzling night sky... Adventurous and physically fit hiking enthusiasts who join a Trekking Tour by Mule Trails Namibia can expect a unique and exciting experience in the wilderness area around the northern part of the Fish River Canyon. Since luggage and equipment are carried by mules, participants only need to pack water and snacks for the day’s hike - and their cameras. A qualified guide explains geology, flora and fauna, a mule driver takes care of the pack animals and a supply team is in charge of the camps. Meals are cooked on an open fire. Shower and toilet offer something out of the ordinary: a view into the great open wilds. The Fish River Canyon, the second largest canyon on earth, runs through the transition zone of two desert systems, the Nama Karoo and the Succulent Karoo (the most diverse desert on earth). The landscape is characterized by meandering gorges up to 500 m deep, which twist and turn through ancient layers of rock. The flora includes unique plants like the quiver tree, candelabra euphorbia or tamarisk; game such as mountain zebra, klipspringer, kudu, duiker, springbok and ostrich abounds in the area. Even waterbirds can be spotted with a little luck, like the African fish eagle which gave its name to this trail. 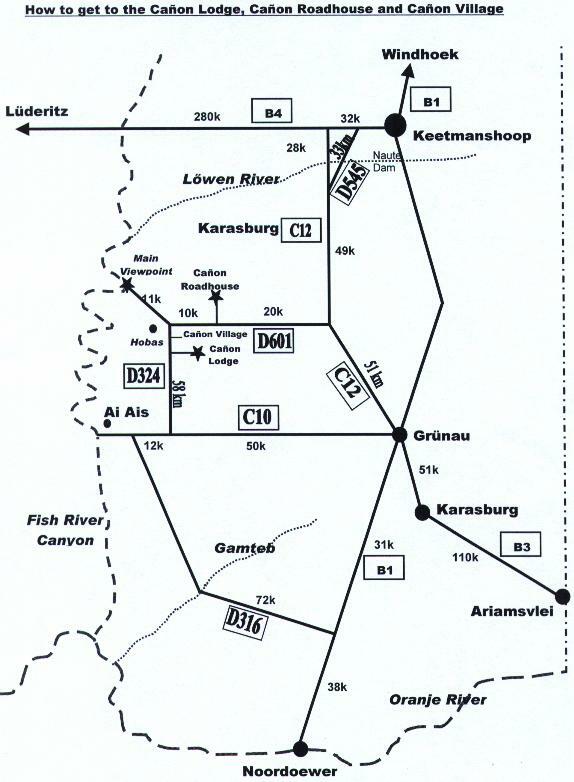 Participants arrive at Cañon House in Gondwana Cañon Park at the Fish River Canyon by their own arrangement. In the evening we discuss all there is to know about the tour and acquaint ourselves with the equipment. (Incl. dinner and accommodation at Cañon House). guests are picked up at their accommodation in Windhoek; light lunch on the way. After breakfast we load our gear onto the mules and set off at around 7h00. We leave the gorge of the seasonal Gaap River on zebra paths, clamber up to plateaus and cross them, and every now and then we stop to marvel at the vast canyon scenery. At midday we have a picnic in the shade while the mules move on ahead of us. In the afternoon we continue down an escarpment, through rugged valleys and across stony and sandy plains. Finally we arrive at the Fish River – and at our first camp. While we enjoy a drink at the campfire our tour guide prepares dinner; anybody who feels like it is welcome to help. The night is spent at Flamingo Bay Camp, in a tent or in the open under the star-studded night sky. (Incl. breakfast, lunch, and dinner). We enjoy our first breakfast out in the open. On smooth, blue dolomite we find abstract rock engravings – traces left by Namibia’s original inhabitants thousands of years ago. Then we continue upstream along the Fish River. Patches of river pebbles alternate with slabs of rock and sand dunes. Dramatic chapters of Earth’s history can be gleaned from the massive layers of rock. At lunchtime, picnic in a shaded little spot. Occasionally we come across deep pools of water in which we take a refreshing dip or fish for Fish River carp. In the afternoon we arrive at Echo Pools Camp – named after the echo reverberating from the arched rockfaces. Sipping sundowners we watch in awe as the rock reflects the light of the setting sun in a blaze of colours. (Incl. breakfast, lunch, and dinner). Today the shortest, but at the same time most strenuous leg of the hike lies ahead of us. A zigzag path as steep as it is littered with stones is the way up, onto a high plateau. The exertion is amply rewarded: with a 360 degree panoramic view across the canyon scenery which extends to the far horizon, 40 km and beyond into every direction - a spectacular contrast to the limited field of vision in the canyon. At midday we find some shade for our picnic. Thus fortified we cross the plateau, past clusters of quiver trees, and come to a little spring. To our amazement there is a high waterfall. Depending on the time of year and the yield of the rainy season it either lies dry or has water cascading over it. In the afternoon the highlight of our tour awaits us: our camp, pitched right next to the rim of the Horse Shoe Canyon. (Incl. breakfast, lunch, and dinner). After breakfast we pile into the open vehicle which takes us to the final destination of our roundtrip. We relish the two-hour drive through the canyon scenery. As we pull up at Cañon House our tour has come to its end. (Incl. breakfast). The alternative for those who do not have a lot of time on their hands. The experience of hiking in the canyon scenery is condensed into 2 hiking days. The Fish River Canyon, the second largest canyon on earth, runs through the transition zone of two desert systems, the Nama Karoo and the Succulent Karoo (the most diverse desert on earth). The landscape is characterized by meandering gorges up to 500 m deep, which twist and turn through ancient layers of rock. The flora includes unique plants like the quiver tree, candelabra euphorbia or tamarisk; game such as mountain zebra, kudu, duiker, springbok, klipspringer (which provided the name for this trail), and ostrich abounds in the area. Even waterbirds can be spotted with a little luck, like the Hammerkop or the African fish eagle. After breakfast we load our gear onto the mules and set off at around 7h00. We leave the gorge of the seasonal Gaap River on zebra paths, clamber up to plateaus and cross them, and every now and then we stop to marvel at the vast canyon scenery. At midday we have a picnic in the shade while the mules move on ahead of us. In the afternoon we continue down an escarpment, through rugged valleys and across stony and sandy plains. Finally we arrive at the Fish River - which we follow upstream. Patches of river pebbles alternate with slabs of rock and sand dunes. Dramatic chapters of Earth’s history can be gleaned from the massive layers of rock. Occasionally we come across deep pools of water in which we take a refreshing dip or fish for Fish River carp. In the afternoon we arrive at Echo Pools Camp – named after the echo reverberating from the arched rockfaces. Sipping sundowners we watch in awe as the rock reflects the light of the setting sun in a blaze of colours. (Incl. breakfast, lunch, and dinner). Today a short, but at the same time strenuous leg of the hike lies ahead of us. A zigzag path as steep as it is littered with stones is the way up, onto a high plateau. The exertion is amply rewarded: with a 360 degree panoramic view across the canyon scenery which extends to the far horizon, 40 km and beyond into every direction - a spectacular contrast to the limited field of vision in the canyon. At midday we find some shade for our picnic. Thus fortified we cross the plateau, past clusters of quiver trees, and come to a little spring. To our amazement there is a high waterfall. Depending on the time of year and the yield of the rainy season it either lies dry or has water cascading over it. In the afternoon the highlight of our tour awaits us: our camp, pitched right next to the rim of the Horse Shoe Canyon. (Incl. breakfast, lunch, and dinner). - Operator urgently recommends that comprehensive insurance cover be taken out before embarking on the tour to make provision for cancellation, curtailment, medical expenses, emergency evacuation, repatriation as well as loss or damage of personal baggage and loss of foreign currency. These hikes are not difficult technically, but they are demanding: fitness and stamina are a prerequisite. On the Fish River Canyon stages you will be walking for 7 to 8 hours per day and carry your daily necessities (6 - 7 kg) yourself – the mules take care of a maximum of 8 kg of luggage per guest. The warm climate and the vastly differing day and night temperatures put additional strain on your body. You need to have a healthy heart and cardiovascular system. You also need to be in good shape and sure-footed as you will be hiking on various terrains. Please check your level of fitness before the tour in order to make sure that you will be able to cope with the additional strain caused by the hot, dry climate. The seasons in southern Africa are at opposite times to those in the northern hemisphere. When it is winter in the north it is summer in southern Africa – and the other way round. But the seasons do not have the same significance for either side. Namibia’s winter is the cooler dry season with considerable differences in temperature and permanent sunshine. Nights can be very cold in the desert (May to August down to minus 5°C), but during the day the thermometer rises to 25°C and more. Such contrasts are a lot to cope with for the human body. The Namibian summer (December to March) is the time when rain may be expected. Rain is a rare occurrence during the rest of the year. From November to February temperatures are generally high and rise to well over 30°C – depending on where you are. Overcast skies for weeks on end are simply unheard of, even during the rainy season (to be more precise: the months with an increased likelihood of rain). This makes Namibia an ideal travel destination throughout the year. Herewith we explicitly point out that our guests participate in this tour entirely at their own risk. We urgently recommend that comprehensive insurance cover be taken out before embarking on the tour to make provision for cancellation, curtailment, medical expenses, emergency evacuation and repatriation as well as loss or damage of personal baggage and loss of foreign currency. Mule Trails Namibia will not be held responsible for any costs arising from any of the above events. Restriction of liability also applies if clients were unaware of this policy. It goes without saying that we do our utmost to conduct the tour as described in the programme; we cannot vouch for it, however. Unfavourable weather conditions, the Fish River in flood, organizational problems, unforeseen events or other factors may force us to change the course of the tour. We apologise for any inconvenience.